“Sticks and stones may break my bones but words can never hurt me” is a little tune I’m willing to bet all of us remember singing when we were little girls, in response to wounding words from bullies and even our friends and siblings. Reciting it was our way of standing up for ourselves, and pretending that these people, and the cruel words they spoke—or actually shouted, as I recollect—could not hurt us. But in reality, those mean-spirited “words” made many of us, myself included, want to go into a corner and cry. How do we overcome hurtful words? With all the crazy name-calling and accusations we see in the press these days, and knowing that the more things change the more they stay the same (another adage, but also one with a lot of truth); I think we should prepare our grandchildren to deal with unpleasant confrontations. Unfortunately, our grandchildren may begin their journey of dealing with verbal harassment in pre-school, let alone the all-to-anxiety-producing environment of kindergarten. But here’s a solution I use. I teach my grands the art of physical discipline, which is what I prefer to call my three short and sweet rules below rather than resorting to long drawn-out explanations that may be lost on them at an early age. These rules are actually simple but effective behavioral techniques that will carry them into their teens—and well beyond since I find I still use them today. 1. Think Twice Before Speaking Once: This is an easy and extremely effective rule of thumb to pound into their little heads (or big heads, I promise you!). Tell them to count to 10. This learned habit gives young and old alike time to think of an appropriate course of action. 3. Run For Help: Often, parents, grandparents or even teachers are standing by when young children experience this situation. But when it is you or their parents, they should feel confident that their “safety nets” nearby love them and can help them. For those of us with tween and teen grands who are being harassed by “bad apples,” take this strategy to the next level level. Here are three ideas you can use to help them in these situations. 1. Help your grands develop a network that will protect them from emotional hurt by teaching them to branch out and make friends in different groups. Try a church or synagogue group, a school group, or a sports group. This way they will have support if they become a target in another group. 2. Help your grands sort out the different meanings of “popular.” Tweens and teens always want to join the popular crowd. We can help our grands see the difference between the group they are comfortable in, and the group that is considered the “in” crowd. 3. Discuss characteristics that are attractive to others: friendliness, enthusiasm, helpfulness, being good-natured, confidence, responsiveness, and so on. If they are lacking in an area, as most tweens and teens are, use your skills to help them develop that part of their personality. Lastly I preach to my grands of all ages about the other side of the coin: their behavior. You may be in a competitive mood, feel like gossiping unfairly, get green-eyed with jealousy or wish someone else’s girlfriend or boyfriend was your girlfriend or boyfriend. And there will be times when you just don’t like some other girl or boy. Put aside whatever is bothering you and WATCH YOUR WORDS. Your words may be forgiven, but often they will never be forgotten. Have you discovered a way to teach your grandchildren about the power of their own words? 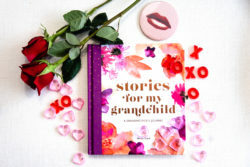 Or, perhaps you have advice for how to help grandchildren overcome hurtful words? Do tell! I would so love to hear from you either in the comments below or on Facebook, Twitter and Instagram. As women, our strength is, and always has been, in our sense of community. I like to use a tube of toothpaste. I squeeze it out and then ask if we can put the paste back in the tube. Of course we cannot, much like the words we speak and the actions we take.